NANO EMULSION FUEL Outline｜NANOFUEL CO., LTD.
Emulsion fuel, is to add water to liquid fuel such as petroleum, to disperse water in the oil. The expected effects of the emulsion fuel is achieving fuel saving by improved combustion efficiency, to reduce PM (Particulate Matter: Particulate matter of carbonaceous) by aiming complete combustion, further to reduce NOx by the latent heat of water. There`s long history of emulsion fuel development among the world and many research institutes, manufacturers had challenged it, however many problems occurred such as, PM (Particulate matter of carbonaceous), NOx (Nitrogen Oxide) reduction effect is seen to some extent, while inevitably basic performance of the fuel deteriorates significantly, also fuel saving is insufficient, raised production cost worsens profitability and so forth. Our Nano-Emulsion fuel, by using the atomization technology of materials, oil film thickness is thin, raise the degree of atomization of oil droplet to the maximum, and achieved large improvement of the combustion efficiency. As a result, without losing the basic performance as a fuel, it has succeeded in achieving enough fuel saving and low-cost fuel, completed a high utility product which is extremely effective for the reductions of PM & NOx. As for the conventional emulsion fuel, an additive of 3%~5% is used, while our Nano-Emulsion fuel only adding a very small amount of additive of around a one-tenth namely 0.3%~0.7% of other companies can keep stability without an irregularity occurring for combustion. Also, fuel saving & PM (Particulate matter of carbonaceous), NOx (Nitrogen Oxide) reduction effect improved drastically by atomizing water particles to the maximum, scattering it uniformly. 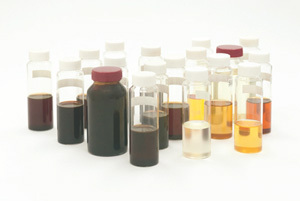 In comparison with other companies emulsion fuel which is greatly changing the form after 90 minutes progress from generation, our Nano-Emulsion fuel keeps the water particle diameter predominantly smaller than other companies emulsion fuel, maintaining the status as immediately after generation with little change. Additives used "NANOEMER" is our originally developed product which can emulsify various oil regardless of the quality and oil type including light oil, plant oil and so on. As for the normal Heavy Fuel Oil, an additive becomes needless. In addition, installation work is simple and easy, and the cost is relatively inexpensive since NEFS adopts a space-saving in-line method, only be placed between the combustion equipment and the fuel tank. Rather than providing a mere standard NEFS, we provide with modified NEFS (Hardware) corresponding to the characteristic of client`s burning system & related equipment, additive composition corresponding to the characteristics of the water properties & fuel that would be used, optimization of additives (software) by adjusting the addition rate as a system, promoting the business that get maximum benefit from improved fuel economy to our clients, in terms of reducing CO2 from fossil fuel decline, exhaust gas improvement such as NOx. By Group companies, practical verification has been carried out in many clients such as industrial furnaces asphalt kiln, aluminum melting furnace, boiler, land-use generator engine, marine main engine and so forth with fuel savings, exhaust gas improvement effect is demonstrated. 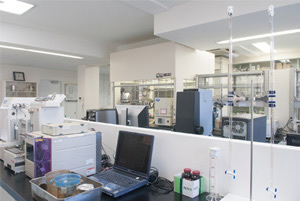 Especially for application to the diesel engine system, through joint tests with several well‐known engine manufacturers, demonstration tests in cooperation with clients, we have received a high evaluation due to simultaneous reduction of NOx & fuel consumption is demonstrated by a system incorporating our NEFS, which has been considered to be a trade-off so far.